Linda's Angels: $30 Terrific Tuesday 4 Hour Flash Giveaway 8 PM - 12 Midnight EST!!! 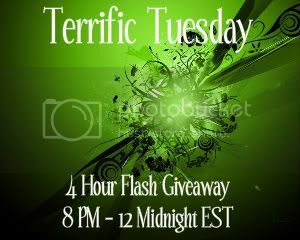 $30 Terrific Tuesday 4 Hour Flash Giveaway 8 PM - 12 Midnight EST!!! Right now I adore Ringer! My current favorite TV show is Criminal Minds! Don't really have a favorite but I like Andy Griffith reruns. I adore Mark Harmon and NCIS.